In the past, I’d make beef stew either in the crock pot or stove top, using a seasoning packet and bouillon. I’d use left over steak or stew meat bought at the store, with plenty of fresh and/or canned vegetables. Now that we are low sodium, I can’t just throw in bouillon and seasoning packets. The sodium is in the thousands in both the broth and bouillon. What we have been learning is the fresher the ingredients, the better the flavor, even without salt. 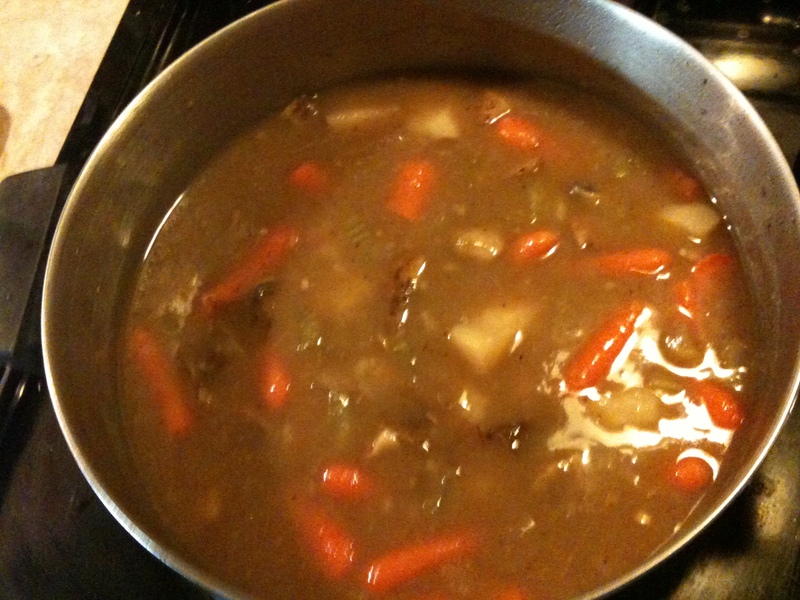 I recently made a beef stew using a low sodium liquid beef broth and just 1 teaspoon of a seasoning packet. I add water 3 times equal to the broth (14.5oz) This keeps the sodium low, but keeps flavor in there. Also, the left over steak was marinated in low sodium Teriyaki sauce, so once cubed and put into the stew, it added flavor. I add cubed potatoes (Russet give an earthy flavor, red potato are a bit sweeter), celery, carrots, green beans, onion and corn. All add their own flavors to the whole stew. 1/4 teaspoon minced garlic and a bay leaf also. It simmers for a couple hours, till all veggies tender. We like it thickened so right before serving we mix corn starch with a little water and then pour into stew. It will thicken the whole thing. Now that we have had ample time to adjust our cooking to very low sodium, its time to start looking at actual measurements of sodium. We did our homework and learned the minimums and maximums of sodium an average, healthy adult should have. 2300 mg is the maximum amount of sodium and can be found in just 1 teaspoon of salt. The minimum is 500 mg. We need sodium, just not an overabundance. Take the hamburger, for instance. At Chilis, the Old Timer, which is most like burgers we make (or used to make) at home. I thought the calories were bad until I saw the sodium. Go ahead, guess………………………………. Ready? 3,050. Well over the recommended maximum. Then add fries, appetizer, etc. In one setting you could have over 4,000 mg.
Well, we can’t have that, now can we? No siree. I set out to completely take the sodium out and help the swelling go down. It did, and then I decided to keep Old Rooster withing a 500-1000 mg diet. Now, I need to make sure we are keeping to that level but still manage to add flavor to our meals. One of our success is a hamburger, modified to fit low sodium. Ground turkey hamburger patty (3.2 oz) seasoned with Mrs. Dash, salt substitute, and pepper (60mg), with lettuce (0mg), purple onion slices (0mg), bun (190mg), dill pickle (70mg) and low sodium bacon (95mg). Total 415mg. Almost half his daily. But if we make fries they have no salt. Our ketchup has no salt. We did without cheese because a slice is extremely high. Now, I need to go figure out the measurements for the killer spaghetti sauce I made tonight using the left over turkey burgers. I mean, it was to die for. It has been almost 3 months since I’ve made a post. Glad to say, PhatHen is alive and kickin’. Just working like the dickens. I decided to jump back into retail management after 3 years… 5 weeks out of town training, then placed in my store 1 month before Thanksgiving. Absolutely hit the floor running and just now slowed down enough to get back to my interests and projects. There is much to share; more recipes (even the Old Rooster has new dishes), health, and family. Hoping all y’all have had a Merry Christmas and wishes for a bright New Year! We worried that we would miss out on the usual, Fall/Winter comforts foods. Soups and stews that just warm you from the inside out. We need worry no more. Swanson and Kitchen Aid have no salt added and reduced sodium broths; beef, chicken and vegetable. I prefer we use the no salt version as there is only 140mg of sodium per 1 cup serving. The reduced sodium still have between 300-400mg of sodium per 1 cup serving. 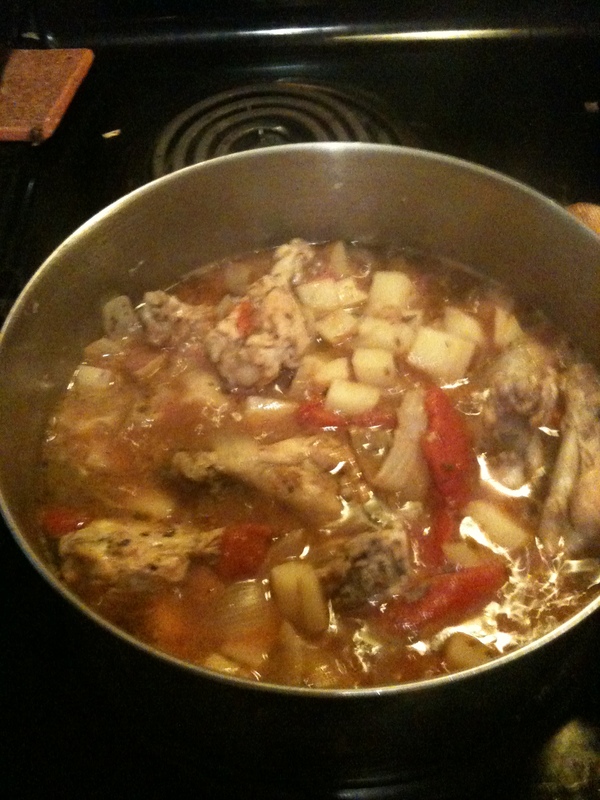 I have used them to make the Chicken Stew Provencal (recipe posted), Chicken Dumplings, and Beef Stew. 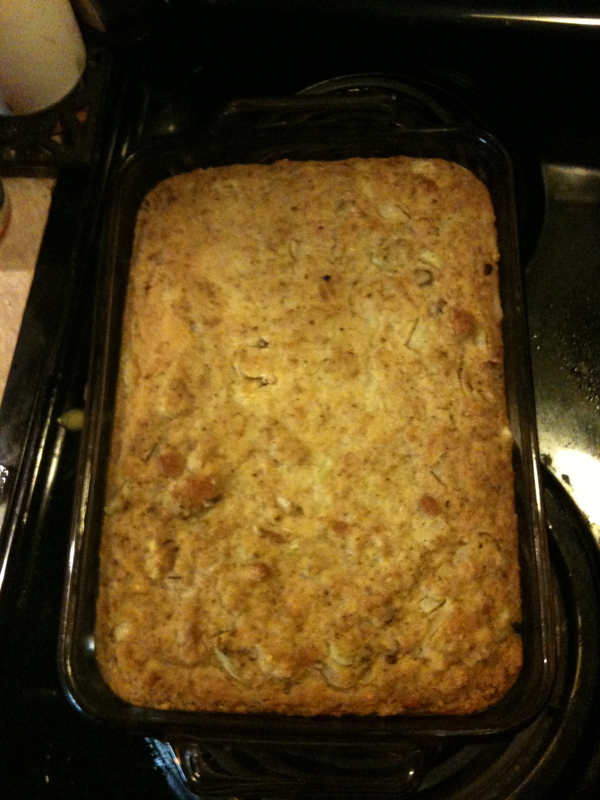 2lbs stew beef, cubed, coated in flour and brown only, do not cook through. Veggies you like in your stew. We use celery, potatoes, onion, and carrot. Enough water and broth, (about 2 cups each depending on the sodium of the broth) to cover your veggies and browned stew meat. Add all ingredients to your stew pot or crockpot, and boil gently till veggies cooked. Add additional seasonings as desired to taste and simmer. Serve with whatever is your desire; bread, crackers, etc. Zippidy doo dah, zippidy-a, my oh my what a wonderful day!!! Its the truth, its actual, everything is satisfactaul. Low sodium bacon is a reality and we have proof right in our tummies!!! Farmland low sodium bacon has only 190 mg per two slices. Old Rooster is doing his happy rooster dance. And so is Phathen. Bacon is one of the hardest things we’ve had to give up. We never ate it a lot, but once it was taken away, it really impacted us. Cooked breakfast this morning with 2 slices each and it was heaven. I highly recommend this low sodium bacon even if you do not have any diet restrictions. It tastes very good and is good for you and your blood pressure. No help on the cholesterol level, so if your diet restricts that, sorry, this can’t help. Go to this website to see what Farmland offers. http://www.farmlandfoods.com/products/lower-sodium-bacon.html We found it locally at Albertsons. Unfortunately for us, the low sodium sausage is still to high in sodium for Old Rooster to have. But we haz bacon and we be happy! Bacon, I miss bacon. Old Rooster misses bacon. Of all the breakfast meats this is the one we miss the most. So, when I saw an ad on tv for low sodium bacon I had to know more. It has only 190 mg per 2 slices!!! That is so awesome. That means we can occasionally indulge in bacon. HAPPY DANCE!!!!! We have yet to try it. If you do before I can report back, give me a review. 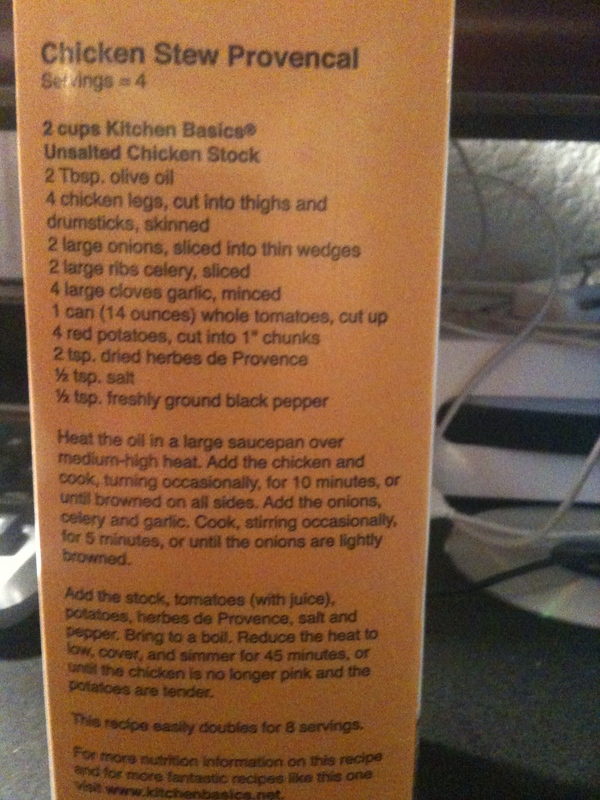 We bought an unsalted Chicken stock by Kitchen Basics (150 mg per 1 cup) and there was this recipe on the side: Chicken Stew Provencal. Decided to try it because we are pretty bored with our standby recipes. Anything in the recipe that called for canned we used no salt added. So, this was not a salt free stew, but a very, very low sodium stew. And it was delicious. Old Rooster really, really liked it. We did not miss the salt at all and we will make this again. 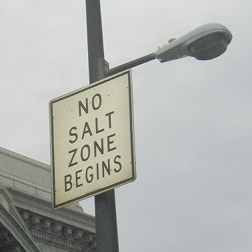 If you are not restricted by salt then just use normal, salt added stuff. 2C chicken stock (we used Kitchen Basics unsalted),2T olive oil, 4 chicken legs cut into thigh and drumsticks (remove skin), 2 large onions cut into thin wedges, 2 large ribs of celery sliced, 4 cloves minded garlic (we use the minced kind in the jar), 1 can whole tomatoes cut up (I had a can of no salt stewed tomatoes), 4 red potatoes cut into 1″ cubes, 2 tsp dried herb Provencal (okay I had to look this up and I had everything but the savory. 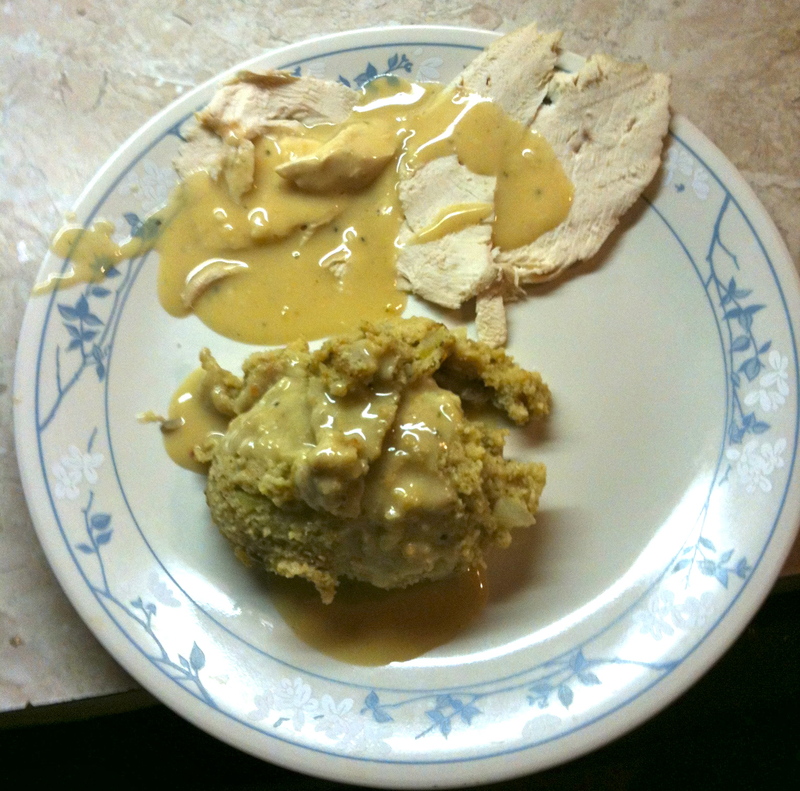 I used 1/4 heaping teaspoon of each), 1/2 t salt (I did NOT add that), 1/4 ground black pepper (I used coarse ground). Use a large pot pan, and add olive oil and chicken. Brown chicken for about 10 minutes. Add onion, garlic and celery and cook for about 5 minutes to soften and brown onion. Add everything else and bring to a boil, then lower heat to simmer 45 minutes. And then you are in heaven. We did not miss the salt.